Sri Lanka’s latest national branding attempt for the ICT/BPM sector ‘IOI - Island of Ingenuity’ was officially launched yesterday, with the Government assuring a Rs. 300 million investment to create a global centre of excellence in high-end product engineering, IP creation and Knowledge Process Outsourcing (KPO). The brand was officially unveiled by Development Strategies and International Trade Minister Malik Samarawickrama at the BMICH, in collaboration with the Sri Lanka Export Development Board (EDB) and Asian Development Bank (ADB), utilising technical assistance funding from the Japan Fund, with PwC serving as consultants. “There is no doubt that Sri Lanka needs a globally-competitive IT industry as a lynchpin in transforming our economy. In total, we will be investing Rs. 300 million in the sector over the coming year. The IT Initiative envisaged in Budget 2018, being implemented by the EDB, will have complementary programs to help second-tier IT firms break into new global markets through a well designed and governed ‘Champion Builder Program,” the Minister said while speaking at the event. Samarawickrama asserted that the launch of the official brand of the Sri Lanka IT/BPM sector, Island of Ingenuity will go down in history as one of the most important milestones in the industry’s journey. The Minister also said this initiative was an important action point in the IT/BPM sector strategy in the forthcoming National Export Strategy (NES). “Let’s now all work together to truly leverage on this new brand and tell the world that in Sri Lanka you will discover an IT industry built on innovation and improvisation and an Island of Ingenuity,” Samarawickrama added. More than 300 companies and 85,000 tech savvy professionals are currently employed in the sector with a high IT literacy rate of 35%. The annual exports of Sri Lanka ICT/BPM last year exceeded $ 1 billion. 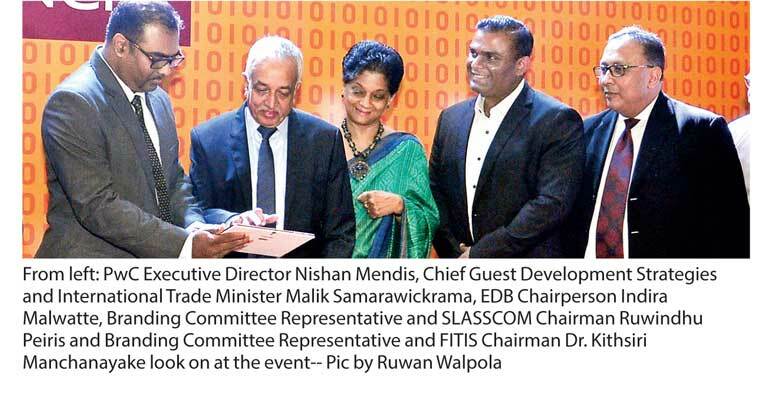 Emphasising that the Government has identified ICT/BPM as a thrust sector for economic development, EDB Chairperson Indira Malwatte said the industry now targets $ 5 billion in revenue to provide 200,000 direct jobs and groom 1,000 start-ups by 2022. “The EDB has taken many initiatives to promote and develop the sector, with both financial and non-financial measures. We have now come to a juncture where it is critical to have a strong national brand for the ICT/BPM industry to create more value addition and to position Sri Lanka as a centre of excellence in the ICT/BPM industry in the global arena,” she stressed. Malwatte said niche skills and expertise in the industry were proven by the many global accolades that the sector has achieved in the past years. SLASSCOM Chairman Ruwindu Peiris outlined the imagination economy and the way the ICT/BPM industry could become the top revenue earner for Sri Lanka in the next 10 years. “There are three key pillars Sri Lanka needs to build on, niche focus areas such as captive innovation centres, positioning itself as the digital gateway to Asia and evolving to be a global digital disruptor by focusing on domain-specific transformative IP and product creation,” he added. Peiris noted that availability and access to top engineering talent, creativity and resourcefulness and a collaborative mentality to co-innovate solutions differentiate Sri Lanka from other locations. Elaborating on creating and conceptualising an industry brand, Ruchi Gunawardena stated that to compete with the best in the world and to market world-class capabilities, a well defined brand coupled with a well executed marketing plan was identified as a central need of the industry to enable it to develop further. For a country like Sri Lanka, which does not have an inherent scale advantage, the focus on creating a brand platform on the manpower skills of providing complex solutions was seen as a powerful and credible claim, he stated. “We put the distinctive capacity for solving complex problems, with the agility to provide highly customised solutions, at the core of our brand — ingenuity,” Gunawardena pointed out. He noted it was identified at the outset that by defining the industry more broadly than the IT or BPO industries to one that is providing “knowledge solutions” to global markets where everything was connected — with a broader spectrum of services such as architectural services, legal services, scientific research services and so on could all be marketed under this brand. “Unknown to many around the world, and even at home, Sri Lanka has been emerging as a leading hub for IT, business process and knowledge-based services. Sri Lankan IT companies have an impressive and prestigious list of global brands as their customers,” he stated. In addition to this, the IT centres in the country are tailored to meet constantly evolving and rapidly changing customer needs through agile and flexible services. These attributes were identified as being the unique, competitive advantages of the Sri Lanka IT/BPO industry, Gunawardena added. RR Donnelley, Virtusa, HSBC, London Stock Exchange, IFS, Pearson and SyscoLabs were highlighted as some of the many examples of global businesses with captive centres in Sri Lanka.